As I've mentioned before I'm going to attempt an F-23 recon build. I have the required kit thanks to the Big Gimper so now I no longer have any excuses. I found an interesting article on the changes that would have been made to make an F-23 production aircraft. I'll make the changes I can without hacking up the whole kit. Inlet shape is very different but that will be easy. I was going to lengthen the fuselage anyway so that's no problem. Changes to the rear fuselage will be much more difficult and would require almost a total scratch build in that area so not likely. At least this makes inaccuracy problems with the kit irrelevant. Biggest problem right now is the paint scheme. All black like an SR-71 or shades of grey? What if I custom mix some grey with a touch of blue? What do you think? Biggest problem right now is the paint scheme. All black like an SR-71 or shades of grey? What if I custom mix some grey with a touch of blue? What do you think? Lozenge? What about a Euro One or SW Asian scheme? I was going for high altitude work. Sort of an SR-71 replacement. The YF-23 had higher altitude, higher speed and better stealth than the F-22 so I thought that would make it a good candidate. So low altitude camo wasn’t what I was thinking of. I guess I should have mentioned that. BTW I’m using the Italeri kit in 1/72. Here is the starting pic. Actually there is some good detail on this kit. The landing gear and ejection seat look pretty good on the sprues. The fuselage looks good overall but the inlets and exhaust need work. The inlets will get changed drastically anyway. There is a weapons bay that's not too bad but it will probably get closed up. I'll be cutting through the middle of that so it will be lost anyway. Maybe tomorrow I will stop planning and start building. Pale Blue then, like the Tacit Blue stealth demonstrator? Maybe the experimental colour scheme applied to a Jaguar GR1 XC XZ103, light aircraft grey with the upper surfaces painted in desert pink when it took part in trials during 2002 at China Lake, California. From the book 'Cold War Jets, Royal Air Force Fighters and Bombers 1943-2007' by Chris Sandham-Bailey. That blue is very intriguing! There is word going around about how Northrop is working with the Japanese to build a stealth aircraft and speculation is it might resemble an F-23. 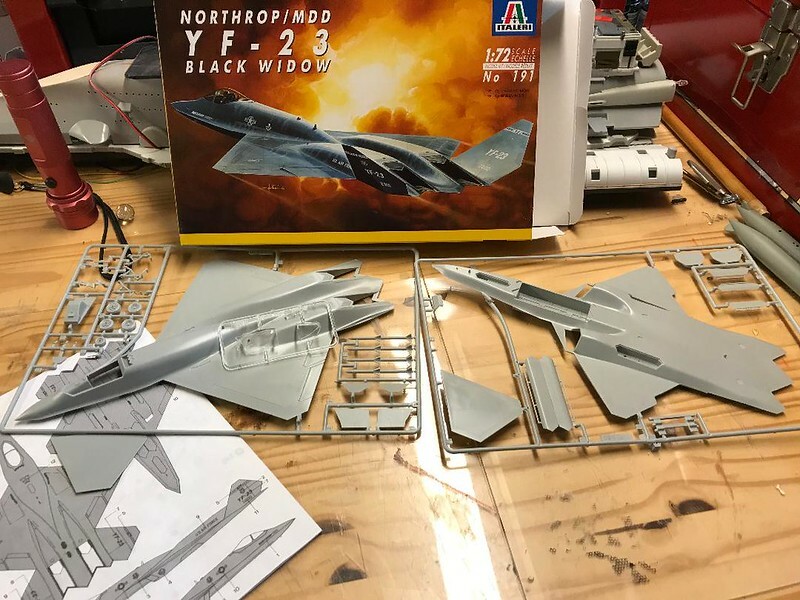 Nice to see a build of the YF-23! I built one of those and i can tell you that the landing gear is very fragile, the right main gear leg oon mine started to bend with the model's own weight and ended up breaking when i set it down after a dusting session. According to the article I found the biggest problem with doing a production version as they describe it is the rear fuselage. The placement of the engines is quite different and would require a total rebuild. Now if real life would get out of my way I might be able to do something with this bird! For a real high altitude camouflage I'd suggest something dark/dull from below (e. g. a very dark blue, black or dark grey), since the atmosphere is thin and there's nothing left to reflect the light that comes from below, and probably something light from above - the uniform bluish grey from Tacit Blue (FS 36320 or 35450?) is IMHO a good option, or try a two-tone scheme like the U-2s that were based in UK and Germany (FS 36622 and 35190, IIRC)? Thanks to everyone for sharing their thoughts on this. The idea of dark color on the bottom and light on top is a reversal I had not thought of. I’ll also check out the U-2 patterns. Otherwise it will be something dark all around. I’ll have to look into the color differences seen on stealth aircraft with a lighter color surrounding all the openings in the skin of the aircraft. Anyone know what that is about? It seems to be very distinct on some aircraft and barely noticeable on others. I'd assume that it is the individual application of radar-absorbing paint or material in these areas, or donor parts from other aircraft.